Here is a lovely, reflective poem for you today. is less traveled or more? millions of light years away. of my own to attend. with a Q.E.D. at the end? I’m a poet and I know it. how long can He hide? Memory plays a truant mistress. That feared and dreaded word. energy – I’m always hyper. at the tip of my fingers. 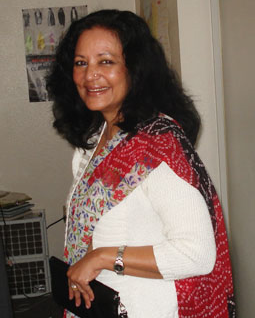 Rashmi Prakash took her Masters in English Literature from Rajasthan University. She has been a lecturer in English Literature in Kanoria College, Jaipur, and actively involved in theater, both in Jaipur and Mumbai. At present she runs her own Mumbai-based company, Nomad Travels, with her husband. Writing is her passion; she is a regular contributor to poetry forums online. Her poetry has been published in ‘Voices from Within’, a Delhi publication, and her travel articles in the Sunday Observer. At present she is working on a novella and some short stories. It trips lightly on the tongue. 👏👏👏👏Lovely! It’s “sort of” in your genes! She’s a nomad traveller in search of a home of sorts. Her verse come on a wing. Can we have more from her? Previous postBirthday Announcement – The Fictional Café Turns 5! Previous post“The Red Panda” Audio Comes Alive — in Video!